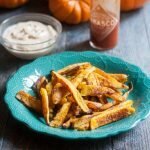 These pumpkin fries with buffalo aioli are a delicious side dish or snack.The sweetness of the pumpkin goes perfectly with the spicy, creamy aioli. Cut pumpkin into small fry sized pieces and let them soak in cold water for 20 minutes. Take them out and towel dry. Bake for 20 minutes or done to your liking. Meanwhile add the mayonnaise, hot sauce and garlic in a small bowl and mix well. Adjust the amount of hot sauce according to your desired spiciness. When fries are done, serve with aioli.